﻿ Holiday Inn Express Zürich Airport Zurich. JIMAT di Agoda.com! Menawarkan perkhidmatan hantar-jemput percuma dari/ke lapangan terbang dan pusat bandaraya, Holiday Inn Express Hotel Airport menawarkan bilik-bilik berhawa dingin dengan TV berskrin rata dan kopi dan teh percuma. Lapangan terbang hanya berjarak 5 km (3 batu) dan tapak-tapak pesta di Zurich juga terletak berhampiran. Pusat bandar Zurich boleh dikunjungi dalam masa 20 minit. Setiap pagi sarapan percuma disediakan dan untuk makan malam, restoran Great Room menyajikan hidangan ringan dan snek. Pada musim panas anda boleh berseronok berehat di teres. Bar/lounge yang luas dibuka 24 jam dan juga menawarkan pelbagai pilihan minuman dan snek. Acara sukan boleh ditonton secara live di skrin besar. Schedule for the free Airport Shuttle Bus: Hotel to Airport: 5:00 until 10:00 every 15 minutes (no bus at 9:00) 10:00 until 11:00 every 30 minutes 12:00 until 15:30 every 30 minutes 16:30 until 19:00 every 30 minutes 20:00 until 00:00 every 30 minutes There is only 1 bus per hour at 11:00, 15:30 and 19:00 Airport to Hotel: 5:15 until 9:00 every 15 minutes (no bus at 9:15) 9:30 until 10:15 every 15 minutes 10:15 until 11:15 every 30 minutes 12:15 until 15:45 every 30 minutes 16:45 until 19:15 every 30 minutes 20:15 until 00:15 every 30 minutes There is only 1 bus per hour at 11:15, 15:45 and 19:15 Please note that places are subject to availability. For the Shuttle from the Hotel to the Airport running until 12:00, a prior reservation is required. The shuttle bus stops at Terminal 2 - GF. Check-in desk could have had more manpower just like the one in Geneva. Free day transport could have been given for tourists during stay in Zurich. Free transports were given to us during our stays in Geneva and Neuchatel. When my usual hotel was not available during my travel dates, I opted to stay at Holiday Inn Express. Check-in and check-out was hassle free. Staff at the front desk, as well as the shuttle driver were always helpful and friendly. Rooms were clean and spacious enough. Will definitely return. Due to delay of trains, I cannot get transit to where I want to go. I book at 11pm and check in at around mindnight. airport shuttle is convenient. the room got no kettle and TV remote, but they helped me to solve them with a nice, polite and helpful way. cause last year, the stuffs are really with bad attitude. This year, they are improved! good! Also the breakfast quality improved as well! nice experience! overall hotel is clean and located near the train station, there is 2 big supermarkets beside the hotel also McDonalds and Subway. hotel breakfast is good on the 1st day of our stay. the second day breakfast, we barely eat anything coz there is food shortage. the hotel didnt seemed to prepare enough food to cater the amount of guests having breakfast that day. about the staff. some of the staff is nice and friendly some doesnt. Had to wait quite a while for shuttle in very cold weather. Cleanest hotel I have seen. Breakfast was so so. No waffles or cinnamon buns. Good transport to airport the following day. Dear Guest, Thank you for booking our property. We are glad to hear that some of our parts in hotel where good for you, and we are very sorry to hear that we did not met all your expectations, we do have very big windows in our hotel and the shuttle is just 1 minute away out side. You should wait inside where we have quiet good temperature. The breakfast corner is our favorite and we try every day to improve with quality and variety, we have pancakes and they are amazing. In the future we should try your idea too. Maybe we will improve with some waffles or cinnamon buns. Our shuttle Bus runs every 15 minutes in the morning and we try to be very serious with runing time, we love when our guests are happy. Hope to see you very soon again. Take care and have a great week ahead. Kind regards The hotel team. Not only free shuttle service to the airport, breakfast provided from 4am! Shuttle bus between airport and hotel. Five minute walk to train station. Clean & fresh, good beds, OK breakfast, good check-in/out, internet, good shower, towels (Agoda said no towels), working aircondition, cant find anything special to complain about. Staff is patient, helpful, and always with a smile on their faces. We dropped our room card in the gap in between the lift, therefore we went down to counter and to request a new room card. We expected to have to bear in some fees for replacement but it wasn't. There was an Indian male staff who served guest during breakfast time, he is friendly and professional. We appreciated their services and happy to stay here again for next visit. 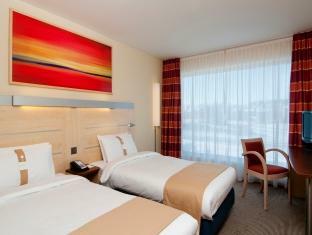 Great location and easy to access to anywhere, free shuttle bus service provided back and fro hotel and airport. After getting robbed in Italy, we were so grateful for the act of kindness from the hotel staff of Zurich airport Express hotel. They waived our carpark fee because they were very sympathetic towards our plight. Staffs were very friendly and kind. 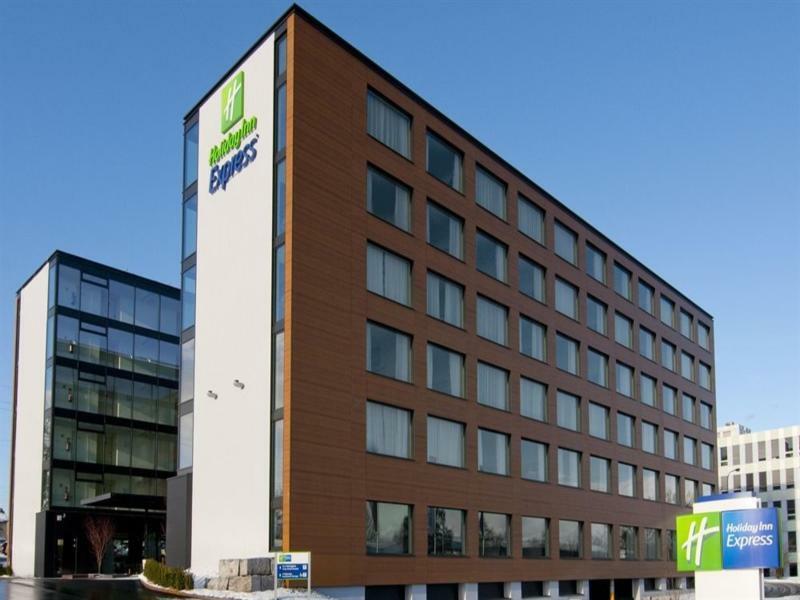 I had a couple of issues during my stay at the Holiday Inn Express in Zurich (1) When I booked in on Monday evening I showed Andrea, the receptionist, my booking for three nights. She took a little while to find my booking but eventually I was put up in a newly refurbished room (G04). She explained that the key entry pads hadn't been fitted yet, so every time I wanted the room opening I had to call at reception and get a member of staff to open the door for me. (2) When the receptionist came with me to open the room on Wednesday evening the door was already unlocked. I realised then that my personal toiletries (shaving brush/cream , toothpaste, toothbrush and comb) had been disposed of by the cleaners. I never got them back. Apparently the hotel only had me booked in for two days. The staff were all very helpful but my stay was spoiled by the two issues. I plan to stay elsewhere on my next visit. Pros - Near to the train station and airport with free shuttle bus to the airport (great choice for those taking early flight). Friendly staffs and clean hotel. Cons - Not much entertainments around the area, however the city area is not very far away from the hotel, will take 20-30mins to the city area. 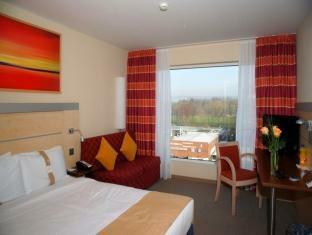 the room is quite comfortable, staffs are helpful and friendly. It takes 5mins to walk to the train station, and there is a free shuttle bus to the airport which is really convenient. in the centre of vendome n champ is a close by. Very convenience & free van services to Zurich Airport.